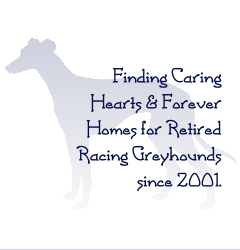 Before applying please read our "FAQs about Owning a Retired Racer" page, and you may also find some insight and points of interest on our "Facts & Info about Greyhounds" page, too. You will most likely be contacted by phone, so please include best times to reach you and at what number (you can mail or e-mail the form). 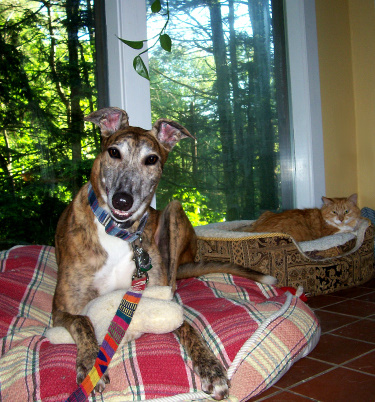 for Canada greyhounds@t-legs.com please include your phone number and best times to reach you. Dogs are shown by appointment only. Please call or e-mail to schedule a visit or to ask for more information. Before placement all NGA Greyhounds receive: veterinary examination, spay or neuter, heartworm test, rabies vaccination, distemper/parvo vaccination, routine worming and flea dip, grooming, nail clipping & ear cleaning. With adoption we include a health certificate, ID tag, and a new collar and leash, they will also go home to you with a muzzle for safety as they learn the ropes of living in a home. Registration papers are included when available.